Just a quick hello to say books are in-stock should anyone need a volume or five. LOL. 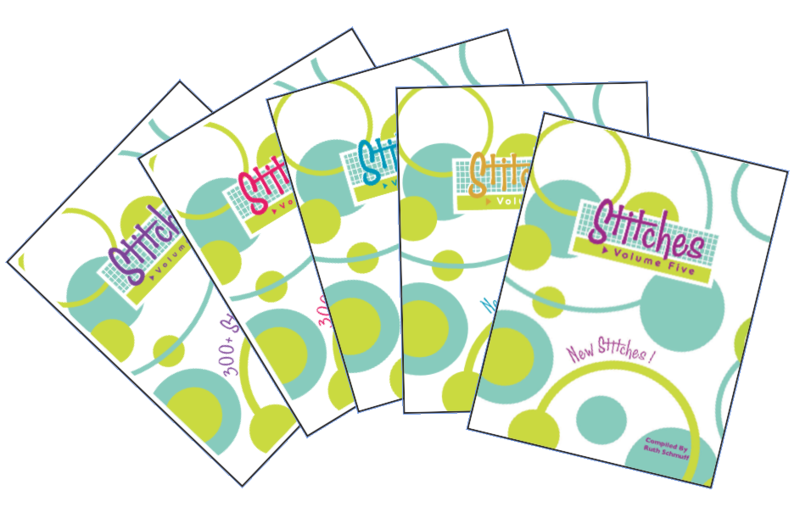 Yes, to date there are five volumes of my stitches books. Each book has anywhere from 250 – 300 stitches diagramed one per page for easy peasy reading. With each guide I write, new stitches are born and then they multiply. Yep, that’s how it happens. Most of the diagrams are numbered so that you know exactly how to execute the stitch. It’s true every once in a while a stitch slips into more than one book under a different name. When you are making up names for stitches you occasionally do it twice. OOPS. Alternating Diagonal Mosaic Variation can also be Wilted Flower Mosaic. The stitches are divided into categories of straight, diagonal, crossed, decorative and more. See the small text footer on the bottom of each page, the index or the table of contents to search in your favorite manner. Some stitches are in multiple sections. A composite stitch that uses both straight stitches and crossed stitches will land in both sections. All 5 books are available in two sizes. 8.5 x 11 or 5.5 x 8.5. Pick your size. The smaller size, affectionately known as the travel size is simply the original book printed smaller. The travel size is the more popular of the two. I continue to produce the large books so that if you started the series with the big books, you can keep it going. Here’s the book page from the website. iphone/ipad apps will be available this Spring or Summer. Here’s the app page from the website in case you need volumes one to four. It’s nice to have your stitches with you at all times. A note to all the wonderful shops that have carried my books in the past. I am sorry to say that I will no longer be able to wholesale the books to you. I have turned over every rock looking for a solution that would keep the quality the same and the retail price to our end stitchers reasonable. Unfortunately I have not been able to find an acceptable solution. Books are only available through Bedecked and Beadazzled. So glad you’re going to do Volume 5 as an app. I have volumes 1 through 4 and refer to them all the time. It’s also appreciated that you have maintained these apps through all the various Apple version upgrades. Most needlepoint app writers have not done this to my great disappointment. Will you be converting this book into an app like you have done before.? If so, when. Watch for Volume 5 to be released as in iPhone app this Spring or Summer. I did buy one of the first app. Besides being very expensive, there wasn’t noted the use of the stitches. With your doing so many stitch guides, I was expecting better!!! I’m sorry you were expecting a different format to the app. I believe that all stitches can be used for any area of a canvas depending upon your thread choice.